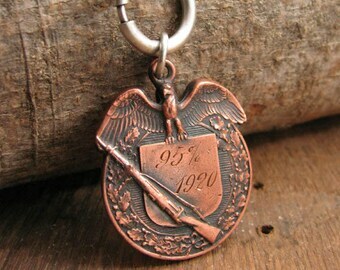 Repurposed Shooting Medal - UNISEX - Antique 1920 Copper Shooting Medallion Necklace - Sharpshooting Award Medal Necklace - RARE FIND! 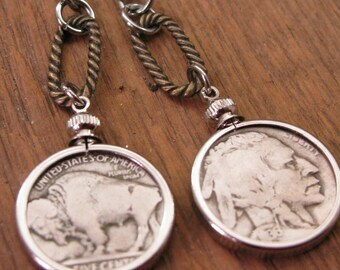 Coin Jewelry - Coin Earrings - Authentic Indian Head Buffalo Nickel Mixed Metal Dangle Earrings - Southwest Style - BEST SELLER! Red Cross - Nursing - Volunteer Work - Vintage American Red Cross Pinback Medallion Necklace. Our American Red Cross earrings have been a best seller over many years. They were even featured in an issue of Flea Market Style Magazine! In recent years, we have scoured to find more of these wonderful red cross pinbacks to make other styles of jewelry like this medallion necklace. These pins are very collectible and this one is no exception hailing from about the 20's. This particular one is a bit worn, but considering it is nearly 100 years old, it looks fantastic! It has the words "I Serve" on it, with the red cross prominently in the center. 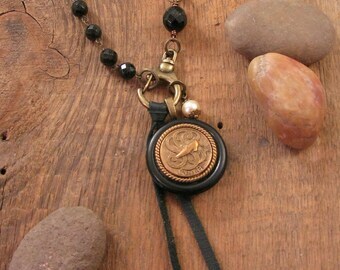 We mounted the pin on a "shield" shaped solid backed medallion, giving it a rather regal look. We carried out the leafy theme with a matching leaf connector. It is hung on our quality antique silver oval cable chain. 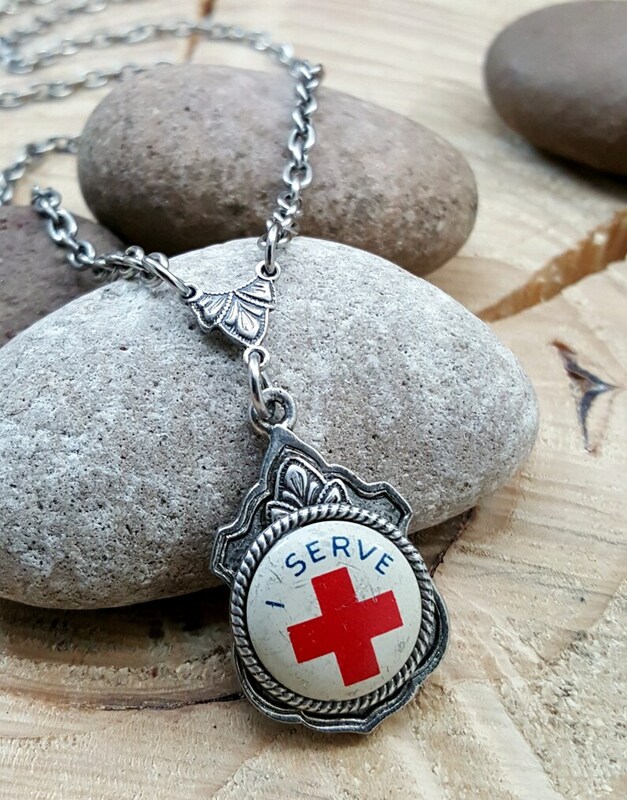 If you are a nurse, give blood on a regular basis and/or support the Red Cross's efforts or are a red cross volunteer, what better way to show that support than with this unique necklace? 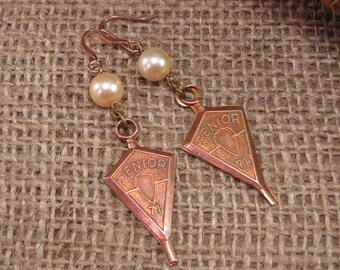 A nursing student would love this for their graduation! 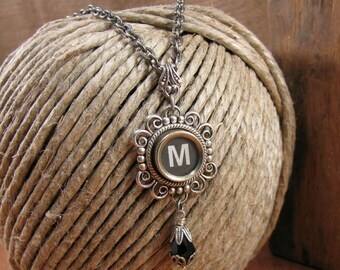 Even LPNs, Nurses Assistants, Interns and Doctors would be proud to have this necklace in their jewelry wardrobe. The American Red Cross was founded by Clara Barton and several acquaintances in Washington, D.C. back in 1881. She heard of the Swiss-inspired International Red Cross Movement while visiting Europe following the Civil War. Returning home, she campaigned for an American Red Cross society and for ratification of the Geneva Convention protecting the war-injured, which the United States ratified in 1882. Barton headed the Red Cross for 23 years, during which time it conducted its first domestic and overseas disaster relief efforts, aided the United States military during the Spanish-American War, and campaigned successfully for the inclusion of peacetime relief work as part of the International Red Cross Movement-the so-called "American Amendment" that initially met with some resistance in Europe. The Red Cross received its first congressional charter in 1900 and a second in 1905, the year after Barton resigned from the organization. This charter-which remains in effect today-sets forth the purposes of the organization that include giving relief to and serving as a medium of communication between members of the American armed forces and their families and providing national and international disaster relief and mitigation. See listings for old Fireman buttons, NYC buttons, UAW pinbacks and other vintage buttons and pins converted into cuff links, earrings and more as only Key of A can do! Ask any questions prior to purchase. Thank you for shopping with us. Upcycled Jewelry and Accessories from Key of A® - Since 2008 we've been upcycling everything but the kitchen sink into stylish, wearable quality jewelry and accessories one refound object at a time! All Key of A® jewelry and accessories are presented in our branded packaging - uniquely mounted, wrapped and gift boxed. We don't skimp on presentation...it's as important as the gift itself in our book! Always check our Shop Announcement at the top of our Shop for any important information, current notices, shipping data, or holiday information before placing your orders! ©2019 The Key of A, LLC d/b/a Key of A®. All Rights Reserved. Titles, Tags and Descriptions are part of The Key of A, LLC’s intellectual copyright and protected by DMCA provisions. Love it. And packaged so nicely and prompt shipping. Thank you so much. Bullet Jewelry - Shotgun Casing Jewelry - The ORIGINAL Mixed Metal Loaded Bullet & Shotshell Charm Bracelet - BEST SELLER for 7 Years! NOTE TO ALL ILLINOIS RESIDENTS: SALES TAX WILL BE CHARGED ON ANY ORDERS FROM ILLINOIS CUSTOMERS. THE CURRENT RATE IS 8.00%. YOU WILL SEE THE TAX AT THE TIME YOU CHECK OUT THROUGH PAYPAL. As a Missouri based corporation, we are required to collect vendor tax, so Missouri residents will be taxed at the vendor rate of 4.225%. Reserved Listings/Custom Orders: Payment for custom made orders is required in full before the order can be created. Because of the nature of our components, we must have payment in order to reserve those components for use in the pieces that comprise your custom order. Our components are found and not mass produced, making them premium in nature and making inventory limited. Although we advertise that we accept custom orders, we have the right to refuse any work that we feel is not within our aesthetic or fit our personal artistic process. LAYAWAY: We do not offer layaway service at this time. GIFT CARDS: We've never offered enclosure/gift cards inside our packaging. Etsy allows you to check that your order is a gift and in turn, the system generates us the gift message you type. We will of course enclose that in the package. RETURNS AND EXCHANGES WITHIN THE PERIODS SET BY ETSY ABOVE (NOT US) ARE SUBJECT TO OUR COMPANY POLICIES, TERMS, CONDITIONS, LIMITATIONS AND RESTRICTIONS AS INDICATED BELOW. FAILURE TO READ THESE IS NOT GROUNDS FOR ACCEPTANCE OF YOUR WANTING A RETURN OR AN EXCHANGE. NOTE: Etsy does not allow customization of the Return and Exchange buttons, so please read our polices regarding both. We will consider both, but under certain circumstances. Contacting us is the FIRST STEP. WE RESERVE THE RIGHT TO REFUSE ANY REFUND OR CANCELLATION. NOTE: Because our jewelry is handcrafted, and often one of a kind work, we do not generally issue refunds or exchanges. Moreso, it is not often that we are ever asked to refund or exchange our one of kind unique handcrafted items since our work is artisan made, of quality construction and craftsmanship, and well, art. PLEASE READ THE INFORMATION BELOW BEFORE DECIDING THAT YOU WANT TO POSSIBLY RETURN OR EXCHANGE YOUR PURCHASE. CONTACT US EITHER WAY AS THIS IS THE FIRST STEP IN THE RETURN/EXCHANGE PROCESS ANYWAY. FOR BOTH DOMESTIC OR INTERNATIONAL ORDERS, THESE SAME CONDITIONS APPLY: We will not give refunds or cancellations for an order not received (i.e. "non-delivery"). We do not refund for any package shipped without insurance that is damaged or lost in shipment. If you have questions about insurance, please contact us prior to purchase. We also do not refund or cancel for errors in your mailing address. Please make sure the address that you have entered into the Etsy system is free of misspellings, is current and is properly capitalized. We export these addresses as they are, we do not retype them. It is a good idea to check your Etsy account address and your Paypal address to make sure they are up to date and consistent before shopping on any online platform. If we do receive an order back to us for non-delivery due to incorrect address, insufficient address or incomplete addresses, we will be happy to reship your items out, but you will have to pay for the additional shipping cost. If you attempt to cancel the order or request a refund at that time, your order will be subject to a 50% restocking fee to cover our cost of handling your package up to that point. We do not refund for the original shipping cost. Although we produce a quality product and confident in its construction, we understand that there may be circumstances that arise. Please read below (**) the reasons for which we will correct an issue and then circumstances under which we will NOT refund or cancel. Any questions, please contact us. **Examples of circumstances that we will correct include but are not limited to: clasps do not work, hard to operate or break, wired beads become loose, jump ring is not tight. Other issues not listed will be determined on a case by case basis. If you have worn the jewelry, we assume that you accepted it as being "great" and everything is "okay" with its construction and operation. Contacting us after you've worn it for a period of time and you claim it is defective does not qualify for return, but we do offer repair services, so we would rather you contact us and HONESTLY relay what happened instead of trying to claim after wearing it that it was all of sudden defective. If it was defective, you should not be wearing it to begin with and you should have already contacted us. **Examples of circumstances that we cannot correct (refund or cancel): You thought the item was bigger or smaller, you decide it's the wrong color, it's heavier or lighter than you thought or perhaps after receiving it, you decide you didn't like it or no longer needed it. Not reading any part of our shop information, policies, descriptions, photos, etc. where the information was disclosed to you prior to making your purchasing decision. We reserve the right to refuse any return. If something should happen in the first 7 days after you've received your item(s), please contact us with details of the issue. We won't know anything is wrong with your purchase or if you are unhappy with your purchase UNLESS YOU CONTACT US AND LET US KNOW! :) Do NOT leave your issue in a review. That is unacceptable and we will contact Etsy regarding this. It could jeopardize your account if you do so as the review platform is NOT a place to try and have your issues resolved. Contacting us DIRECTLY is the proper avenue. If your item(s) is damaged in shipment, again, immediately contact us and we can arrange for a replacement if the item cannot be repaired. We will work with you on a suitable solution to assure your satisfaction on these particular issues. SPECIAL NOTE: WE CANNOT ACCEPT ANY JEWELRY FOR RETURN OR EXCHANGE THAT HAS BEEN MATERIALLY ALTERED AFTER PURCHASE/RECEIPT BY CUSTOMER. Any alterations immediately void any policies on returns/exchanges. We can only guarantee and stand behind the jewelry as shipped and in the manner of construction and with the components utilized at time of shipment. If you are unhappy with a component upon receipt, do not attempt to change it, simply contact us about your issue. A NOTE ABOUT CANCELLING AN ORDER THROUGH THE ETSY PLATFORM: This is a service offered by ETSY, but not by KEY OF A/SURESHOT JEWELRY. We do not accept an order cancellation once your order has been placed with us and put into processing. Processing of all orders generally begins the next business day. Our processing times are BASED ON BUSINESS DAYS. "Business Days" are defined historically as Monday thru Friday. We are not open on the weekends, except in the case of holidays and busy times, but our processing and shipping days are still tied to business days. Our jewelry is handcrafted, not mass produced so we have production times and systems in place in order to expedite our orders in a timely manner for all of our customer orders. Because of our system, cancellations requested after the order is in processing are subject to a 50% restocking fee. Cancelling an order once we receive it back for any reason and make contact with you to arrange for reshipping will be subject to a 50% restocking fee if you decide to cancel it at that time. Any filled order that is cancelled prior to shipment is also subject to a 50% restocking fee. Any order that had special requests such as a brand preference, caliber preference or color preference or a complete custom order (Reserved Listing created specifically for that customer), is subject to a 50% restocking fee. AUTHORIZATION FOR RETURNS/EXCHANGES: Returns/Exchanges sent to us without first receiving authorization for such exchange/return are subject to a 50% restocking fee. Shipping costs are not refundable. Purchases made through this Etsy platform are subject to the policies IN THIS SHOP ONLY. We are an independent business outside of the Etsy platform and we only utilize and pay for the space within the Etsy platform to sell our merchandise. Etsy is in no way an officer of our company, nor does Etsy have any interest in our corporation, thus does not control our business operations in any way. Any policies of our other websites where we may sell our products lines do NOT apply to the policies we post in regard to the operations of this Etsy shop. PURCHASES DURING HOLIDAY SEASONS. If your purchase is made during the holiday season, PLEASE REFER TO OUR SHOP ANNOUNCEMENT, if any, for any specific information pertaining to processing times, cut off dates, shipping times, USPS schedules, and custom orders since the holiday season brings with it higher volumes of business to our shop and may affect our normal processing times, cut off dates, shipping times and custom orders. We note this since we will not accept a return or exchange because of a perceived shipping time period by the customer. NUANCES OF BUYING HANDCRAFTED, ARTISAN MADE JEWELRY: Remember that you are purchasing artisan made jewelry with authentic, vintage, refound, or even hard to find and rare components, not mass produced goods from a big box retailer like Amazon, Wayfair, or other large online retailers. We create each individual piece by hand thus we hope that you are shopping Etsy for these very reasons - to buy artisan made, handcrafted, made in the USA work and that you support this and embrace this. In buying from such a business, you are helping support small businesses in general and you appreciate the time, creativity, passion and labor that goes into every piece of jewelry we offer to you. You appreciate and respect these aspects as opposed to shopping a big retailer who purchases large quantities of mass produced jewelry at a discount, assembled in third world countries, with components that are reproduced thousands of times and cost pennies on the dollar to make, thus they can afford to take exchanges or take returns, because of their cheap labor and quantity purchases to supply their huge stores. We would rather you shop elsewhere if these are things that don't matter to you, but we would like to think that you shopped our store because you did care and you saw the "blood, sweat and tears" that went into our work to make something special for you to purchase, something unique, something artisan made and handcrafted right here in the United States. We thank you for shopping with us and supporting small businesses like ours, we really do! NUANCES REGARDING OUR WORK AND COMPONENTS AS MAKERS OF UPCYCLED JEWELRY. 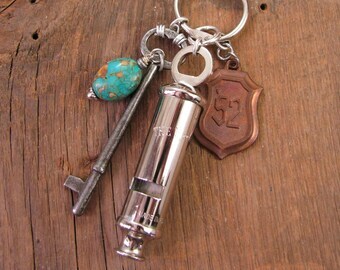 We do our best to describe our found objects with their sizes in our listing descriptions and through our photographs. We understand that you may not be familiar with certain found objects or components used in our designs. Some objects we feel speak for themselves in size, weight, height or width, but if you have any doubts or are not sure, and your questions are not answered thru the listing photos, please err on the side of contacting us right from the listing PRIOR to purchasing. Also, because we utilize small antiquities and other refound objects in our work, we cannot guarantee the metal content of these pieces, nor can we always know the metal content of them, thus, we cannot be responsible for allergies or reactions to jewelry containing such components and recommend that you read the listing descriptions carefully and ask any questions prior to purchase if you are unsure if you are able to wear certain metals or have any metal allergies. In some cases, certain customers may be unable to wear jewelry of a specific metal or combination of metals. Outside factors such as soaps, lotions, perfumes, medications, oils in the skin, perspiration, dirt on the skin, and overall skin biology can and will cause jewelry to react and we are not responsible for these kinds of claims and will not refund for them, but will assist customers in determining such causes. Again, it is best to ask any questions about our products prior to purchase. DISCLAIMER REGARDING PURCHASING PRODUCTS ONLINE: A note also about viewing any products on your own computer monitor: Actual colors may vary. This is due to the fact that every computer monitor has a different capability to display colors and that everyone sees these colors differently. We try to edit our photos to show the samples as life-like as possible, but please understand the actual color may vary slightly from your monitor. We cannot guarantee that the color you see accurately portrays the true color of the product. RIGHT OF SUBSTITUTION: In addition, we do reserve the right to make substitutions of similar like/kind components where we feel that quality is an issue or if a supplier/manufacturer changes or alters a component and we have no choice but to substitute with like/kind. Because our work is handcrafted and utilizes refound objects, we sometimes will re-evaluate or respond to customer feedback regarding a product and will research and replace the component with one of like/kind but of a higher quality. As a result, sometimes the photos may reflect the original component or finding until we can replace the photos with the improved and modified look. As experienced artists, we will always make sure that the aesthetic of our work remains consistent. Feel free to email us with any questions or concerns. VALUE OF READING OUR LISTING DESCRIPTIONS: We can't stress enough that you read the listing descriptions in their entirety as most if not all of your questions can be found there. As a convenience, Etsy sets up the listings structure so you can simply click on the "Ask a Question" box located in all listing descriptions as ]] convenience. By emailing us from this location, Etsy will provide a link automatically in the email you send, making it more efficient for us to quickly communicate and help with your questions. Also, for convenience, all listing descriptions include a "Shipping & Policies" tab so you can click and read our processing and shipping fees/methods before making your purchasing decisions. If you still have questions, please email us through the Etsy system, preferably from the Order Receipt so it will link your order and we can more efficiently respond. We ship throughout the United States, Canada and Worldwide. We do not ship daily, but your order will be processed and shipped within 4-5 business days with the exception of the holiday season, where we may extend that time period due to volume. We generally have a 5-7 business day turnaround time for custom orders. For wedding orders or other orders where multiple items are needed (i.e. cuff links), please allow 7-10 business days. For any questions, just email us! That's what we are here for! Our processing times are BASED ON BUSINESS DAYS. "Business Days" are defined historically as Monday thru Friday. We are not open on the weekends, except in the case of holidays and busy times, but our processing and shipping days are still tied to business days. Please remember, we are not pulling items off of a shelf and shipping them out. You have chosen to purchase artisan made, handcrafted jewelry from a small business. Many of our designs are made to order and/or can require additional processing unlike that of mass produced warehouse based distribution centers. We are a small studio and we take great care and hands on application to ensure your order is taken care of and shipped. All listings in ANY SHOP ON THE ETSY PLATFORM have a tab labeled "Shipping" that is available to you and contains valuable information about that individual shop's shipping polices and procedures. Because this is available to you prior to purchase, we are not responsible for any shipping issues that pertain to the information provided under that tab. When you complete your transaction, you are accepting those policies and procedures. Need to know when your order will likely ship? YOUR ORDER RECEIPT THAT YOU PRINT FROM THE Etsy SYSTEM INDICATES YOUR "SHIP BY" DATE. IT IS IN BOLD AND ON THE RIGHT COLUMN OF THE RECEIPT. Use that as a guide. Exceptions are custom orders which will have the production and shipping time stated in the individual Reserved Listing itself and Holidays wherein we will post the current processing times for that particular holiday and finally, if we contact you regarding your order via the Etsy platform and indicate a shipping delay. If you need your order shipped faster, we offer several methods at checkout to choose from. If you are still not sure, just contact us and we will discuss your particular situation and see if we can help. SPECIAL REQUESTS FOR BRANDS, CALIBERS, KEY CHOICES, ETC. If you have made a special request for certain brands or calibers in the case of bullet casings or shotgun casings, or perhaps you wanted a certain key choice of a typewriter jewelry piece, etc. all of these situations can affect the stated processing times. Listings may indicate this as well in their descriptions. When in doubt, simply contact us! A NOTE ON WEDDING ORDERS: Please allow us up to two weeks processing time on multiple item orders for weddings or similar events. Also, leave a note in the "note from buyer" area the date of your event or wedding or contact us if you are ordering late so we can work with you. ORDERING AS A GIFT AND YOU ARE SHIPPING IT DIRECTLY TO THE RECIPIENT ADDRESS? Please use the Etsy system to indicate that your order is a gift. Note that as a standard procedure, we enclose a copy of the order in every package. We are not responsible if you fail to mark your order is a gift. Etsy conveniently allows you to mark the order as gift, which in turn, will change the format of the order we work from to ensure no pricing information is contained as well to allow you to type a message directly to the recipient that shows up on that reformatted receipt. Kinda cool, eh?! BEFORE CONTACTING US with any shipping issues, PLEASE CHECK YOUR ORDER RECEIPT FOR THE STATED "Ship By" date indicated. Also, utilize the tracking number to see the status of your package. If you purchased during the holiday season, please refer to our Shop Announcement for any exceptions to the "ship by" date stated on your Order Receipt. If you have already received a Shipping Notification email that contained your tracking information, please use the tracking number link in that email which will take you to the USPS website in order for you to track your package. We use Stamps.com to process all of our packages thus all of our packages are incorporated into the USPS system as soon as the post office takes possession of them and scans the barcode on your particular package. Also, please check the address you have entered in the Etsy system. This is the address we use to ship your purchases. We do not cancel or refund orders if your address was incorrect in the system at the time you placed your order and subsequently shipped to the that address. We are not responsible for missing addresses, incorrect addressees, no addressee, etc. It is your responsibility to type in the correct address. First Class Mail thru USPS generally takes 3-5 days anywhere in the US. Priority Shipping generally takes 2-3 business days. Express Mail generally takes 1-2 business days and there is an option for Sunday delivery with this service. These shipping times are quoted directly from USPS: go to www.usps.com for more details on these shipping methods. OUR ORIGIN ZIP CODE FOR SHIPPING TO YOU IS 62306. Please use that when determining from the USPS website an estimate of your shipping times. Our shipping costs stated on all listings are based on U.S. First Class mail at $4.95. Additional items you add to your cart from our shop will calculate at $1.30 each. Why don't we offer free shipping? Because our presentation, packaging and shipping is just as unique as the products we sell, so we incorporate that cost into the shipping amount. We use quality gift boxes, ribbons, tissue and jewelry mounting cards that together, make for exceptional packaging and presentation. It is what has made us successful over the last ten years. If you would like your item shipped faster, the dropdown at checkout allows you to choose either Priority Mail or Express Mail in addition to First Class. Charges for those methods will show at checkout. These methods are "zip code" based meaning that turnaround times can vary, but generally Priority Mail is 2-3 business days and Express Mail is 1-2 business days. Our origin zip code is 62306 if you wish to visit the USPS website and get some estimates of turnaround times prior to placing your order. Please remember to incorporate our processing time into your own estimate. If you would like insurance on your item(s), it will be extra. Note that insurance is provided through USPS automatically and free for up to a $50 value on Priority Mail Service. It does NOT provide insurance on First Class Mail. If you would like your package insured and have chosen First Class Mail as your shipping method at checkout, you will need to contact us to get insurance as it is based on the value of the item or items being shipped. Value does play an issue with insurance costs, but we can quote you based on the amount of your purchase. Please contact us PRIOR to purchasing if you want your purchase insured. We will create a special listing for you to purchase that insurance. At this time, we ship internationally via First Class International shipping. If you are wanting faster international service, please contact us. We can quote you shipping based on what you are intending to purchase. No problem. We are happy to help. Note that there is no tracking number or insurance of any kind with this method of shipping. You will be provided with a shipping notification email the day your order ships that will contain a "Customs Number". This number will travel on the package, but once the package leaves US soil, we have NO WAY of tracking the package until your destination country receives it through its customs department and scans it. Please don't contact us to let you know where the package is. We don't know that information. We will ship your package to the address you provide through Etsy within 4-5 business days of your payment with the exception of a holiday where our processing time may extend to 7 business days or more. PLEASE NOTE: WE ARE NOT RESPONSIBLE FOR ANY DUTY OR CUSTOM CHARGES ASSESSED AT THE DESTINATION COUNTRY. THESE ARE YOUR RESPONSIBILITY. Again, please realize that once your package leaves the United States, we do not have any control over it, thus we are not liable for things such as loss, theft, customs situations or errors, or non-delivery and will not issue refunds for these situations. If packages are returned from your receiving country for any reason, we will contact you for re-delivery when and only if we ever receive the package back. This can take up to six months or more, and there is a chance we never receive it back. Again, no refunds will be given (see above). Just the same, we will not be able to tell you any specifics about the whereabouts of your package. If and when we get a returned international package back, we will contact you regarding redelivery and collect a new shipping charge at that time. If, at that time, you are not wanting it re-shipped, there is a 50% restocking fee/handling fee and of course the original shipping fee will not be refunded. All international shipments require a Customs Declaration Form. Note that because some countries can prohibit the shipping of jewelry, we declare the contents of your package as being "costume jewelry" and will list the value of your item(s) as well. This will avoid the possibility of your shipment being held up in Customs for any reason. Note that we will not give refunds or cancellations for an order not received (i.e. "non-delivery"). We also do not refund or cancel for errors in your mailing address. Please make sure the address that you have entered into the Etsy system is free of misspellings, is current and is properly capitalized. We export these addresses as they are, we do not retype them. It is a good idea to check your Etsy account address and your Paypal address to make sure they are up to date and consistent before shopping on ANY online platform. If we do receive an order back to us for non-delivery due to incorrect address, insufficient address or incomplete addresses, we will be happy to reship your items out, but you will have to pay for the shipping cost. If you attempt to cancel the order or request a refund at that time, your order will be subject to a 50% restocking fee to cover our cost of handling your package up to that point. We do not refund for the original shipping cost. If you receive your package damaged in any way, including missing contents, we are not responsible if you opted for First Class Mail service and did not request insurance. On Priority Mail service, it this occurs, you will need to file a claim on the USPS website. Please keep the package and any contents as you will need this in order to submit the claim. Instructions for filing a claim are on the USPS website. A NOTE ABOUT CANCELLING AN ORDER THROUGH THE ETSY PLATFORM: This is a service offered by ETSY, but not by KEY OF A. We do not accept an order cancellation once your order has been put into processing. Processing begins on the next business day from the date of your order. Our jewelry is handcrafted, not mass produced so we have production times and systems in place in order to expedite our orders in a timely manner for all of our customer orders at any time. Cancellations requested after the order is in processing are subject to a 50% restocking fee. As always, please contact us with any questions or concerns. As stated above: WE RESERVE THE RIGHT TO REFUSE ANY REFUND OR CANCELLATION. PERIOD. Note that we ship all of our jewelry in bubble packs so as not to damage the gift box(es) within. We uniquely mount all of our jewelry and accessories, wrap them in coordinating tissue, and enclose them in our branded gift boxes with jute or ribbon type tie/bow. On holidays, we offer themed holiday tissue in the box and coordinating holiday ribbon that keeps with our general branding. We have very strong branding, so our packaging is most attractive, ready for gift giving and secure for shipping within the bubble mailers. Sorry, but we do not have enclosure cards other than the gift order receipt where you type your message and it is ultimately printed on that receipt. See above. We offer Express Mail service through the USPS. It is a 1-2 business day service that is zip code dependent. Use the dropdown at checkout to choose this method. Go to www. usps.com to find out the turnaround time from our zip to yours. Our shipping zip code is 62306. If you have a business account through UPS or FEDEX, we can certainly utilize that, but there will be an extra charge for our time, labor, gas to make a special trip to our particular local UPS or FEDEX office. Best to contact us first if you are wanting to do this. ENGRAVING: We are not engravers. Engraving is a service provided by any local jewelry store in your particular area or an engraving shop for very little cost. Our studio does not house the necessary and expensive equipment to provide such a service. CUSTOM ORDERS: Although our shop is set to accept custom orders as per Etsy's feature, we accept custom orders on case by case basis and can refuse to accept a custom order for any reason. We accept customer submitted pieces in our work dependent on prior photos of those pieces and compatibility of those pieces in our designs or ability in general to convert them tastefully into jewelry applications subject to our style and aesthetic. Keep in mind that we utilize vintage and authentic components ourselves, many one of a kind, found, or limited in existence, and no longer produced, so our inventory can vary from week to week, meaning that a custom order where we are sourcing the vintage components could take weeks to months to create depending on availability of components on hand at the time of your request, our ability to search, find, and source those components. Be assured though, that we will try to accommodate your request if we are able. We reserve the right to refuse any custom request. In the case of any of our SureShot Jewelry designs, and you are interested in submitting your own casings for use in designs from specifically the SureShot Jewelry collection, these requests can only be processed thru our website at www.sureshotjewelry.com and clicking on the box at the bottom of the Home Page labeled, "Your Casings, Our Designs". This is a special service that SureShot has always provided and we are happy to help you. Any questions you still have? Please email us. We're here to help. Please contact us for any custom requests. We do use customer submitted items, antiquities and spent ammo. Email us to learn how to submit your pieces to us. Our listings contain details on the size of a particular product. If you are needing a special size and the listing description indicates this as an option, please contact us for details. Some jewelry items may not be adjustable or be resized. Read complete listing description or contact us with any questions. We will do our best to assist you. Our SureShot Jewelry (shotgun & bullet casing) collection is available for wholesale to gift stores, western shops, home decor, gun shops and other related brick and mortar stores. If you are interested in becoming part of our SureShot Retail family, please use the submission form located on our desktop website. Go to the Home Page at https://www.sureshotjewelry.com and click on the "Become a Retailer" link at the top or bottom of the page. If you are interested in purchasing Key of A products for your shop, please email us at sales@thekeyofa.com for how to apply. All jewelry comes mounted on a branded jewelry card, tissue wrapped and gift boxed in our coordinating branded packaging, and then ribbon tied, ready for gift giving. SPECIAL - 25% OFF! Charm Bracelet - Repurposed Vintage School Medal Charm Bracelet - Movies, Photography, Editor, Usher, First Aid & More! Typewriter Key Jewelry - Letter Necklace - Personalized Jewelry - Black Initial J Typewriter Key Necklace - Gift for Her - MORE KEY CHOICES! Letter Necklace - Typewriter Key Jewelry - Personalized Jewelry - Black Initial M Typewriter Key Necklace - Gift for Her - MORE KEY CHOICES! Typewriter Key Jewelry - Authentic Black Initial "K" Typewriter Key on Flowery Filigree Antique Brass Pendant/Necklace - BEST SELLER!